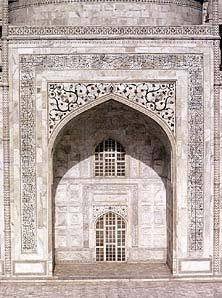 According to art historian Milo Beach, "The Koranic inscriptions around the archways and the gateways of the Taj are stone inlayed into stone. Simply as an artistic device it's breathtaking, because it has all the naturalness of a pen stroke, but it was designed by a calligrapher and then, essentially, copied in stone." "Calligraphy was an enormously important art form, because the calligrapher was writing the word of God, the holy word itself. So he was considered to be a direct conduit for the revelation of divinity on earth and was given an enormous amount of importance. In the hierarchy of the arts, calligraphy would have been considered the most important of all." Most artists and architects of the time never achieved celebrity for their achievements; it was the patron who received recognition for their work. But perhaps because of the importance of his honored profession, the chief calligrapher was allowed to record his name on the Taj Mahal. Near the lines from the Koran at the base of the interior dome is the inscription, "Written by the insignificant being, Amanat Khan Shirazi."